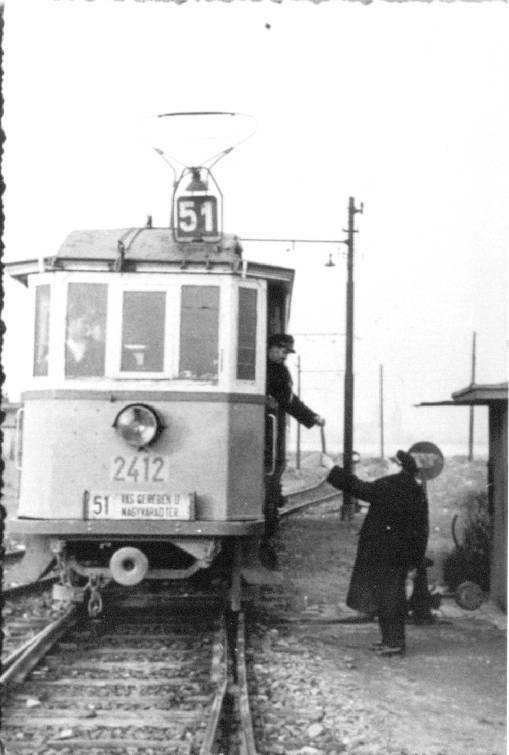 The first tramline of Budapest-Szentlőrinc Local Electric Railway (BLVV) to Kispest and Pestszentőrinc was opened in 1900, (since 1887 there was a narrow-gauge steam railway, wich was rebuilt to electric and normal-gauge). 20 tramcars was bought in 1911-12 (21-40), and further 30 in 1914 (41-50, 61-65,1001-1015). On these cars was ten-window frame. 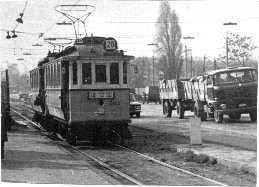 30 ten-window trailers in 1914 (165-180, 185-198). 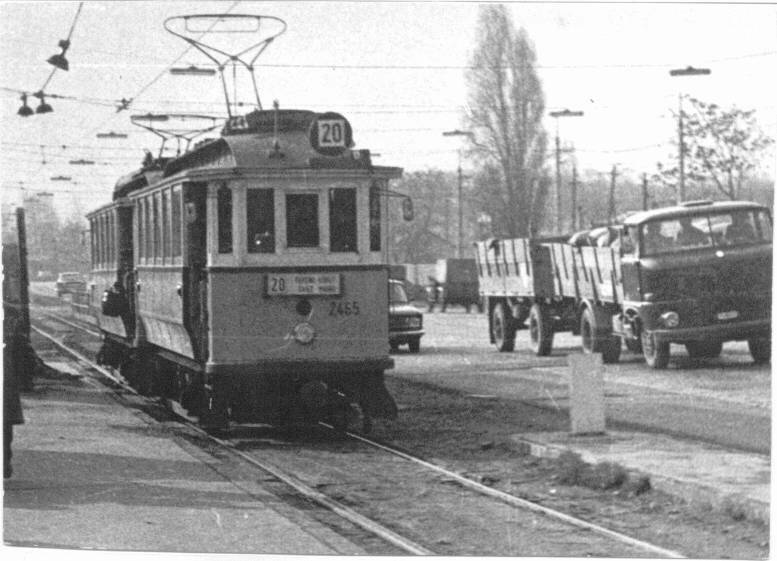 All of these cars (except the first tramcars) were converted to twin tramcars between 1926 and 1930: either coupling two motorcars, two trailers or a tramcar and a trailer. All these compositoins recieved one motor and controller of each car. 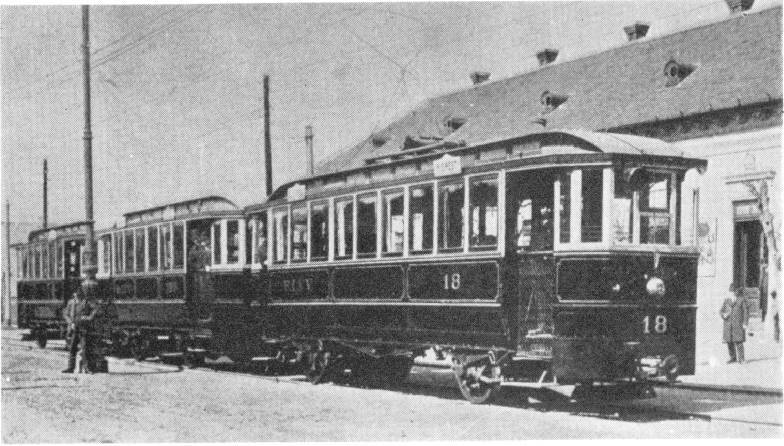 The BLVV's # 18 nine-window motorcar pulling two small trailer in Kispest (around 1900). 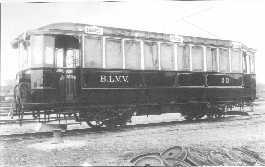 The so called "workers train": a loco pulling four nine-window trailers near the depot and power station of BLVV in Kispest (around 1900). 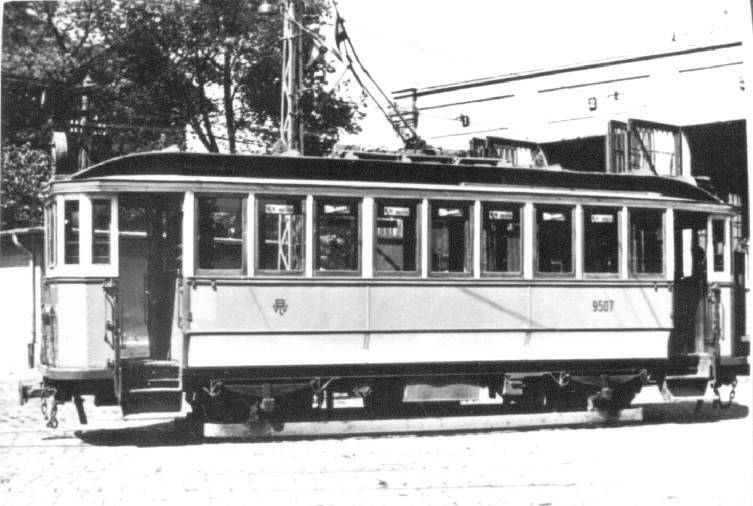 Four cars were supplied with Westinghouse brakes, four had no pressure brakes. 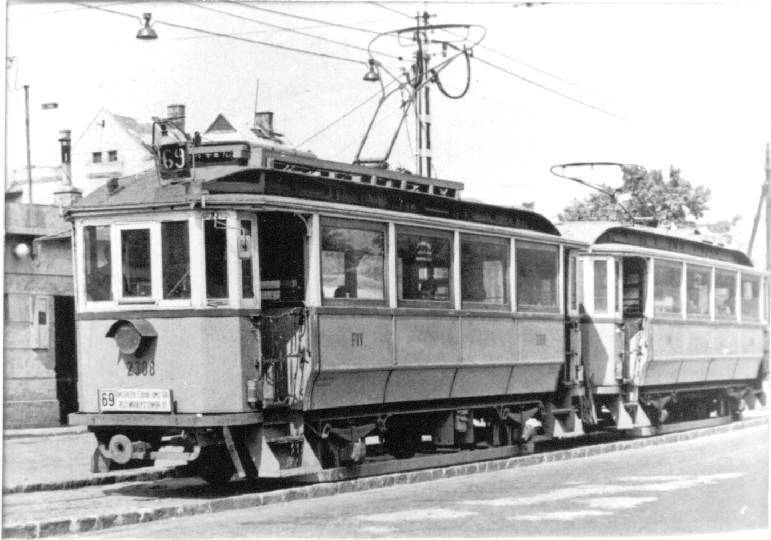 The freshly bought # 30 ten-window tramcar (around 1912). 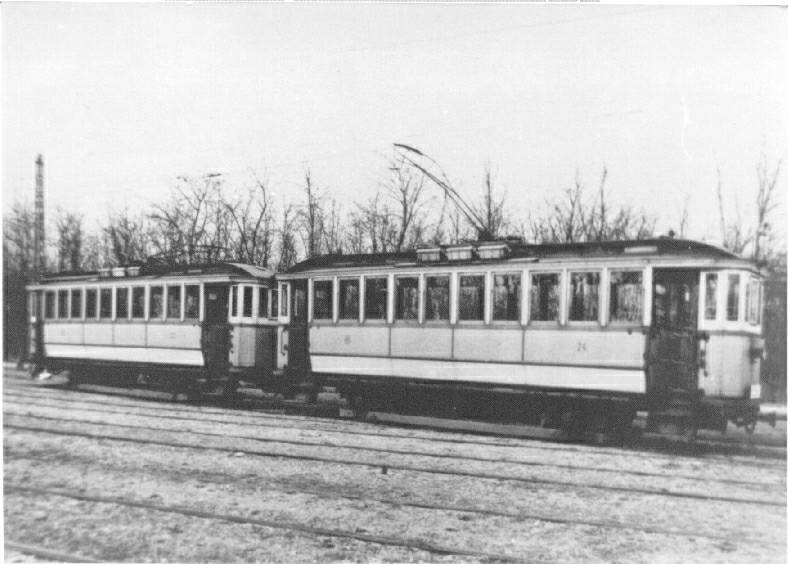 The # 24+23 ten-window twin car in Száva depot (in 1930). 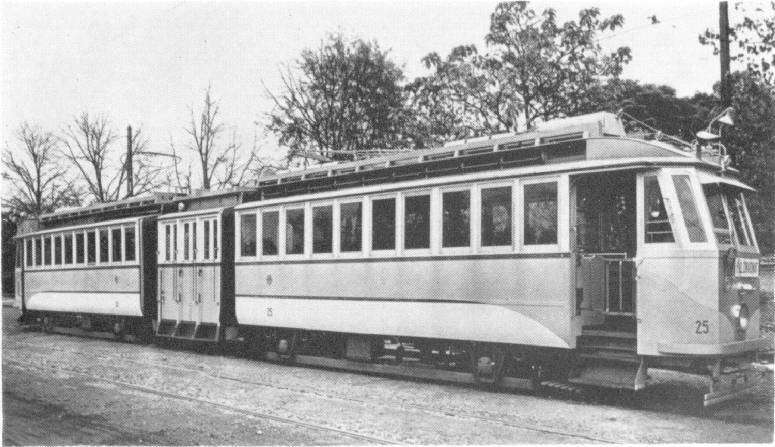 In 1938 the ten-window twin car # 25+26 was rebuilt to a four-motored articulated unit. It recieved the nickname "Adél". 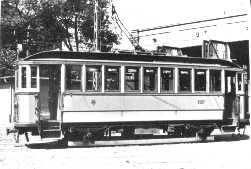 For the four motor construction they supplied this car with a servo driving: the servo always worked in a back car, and copied the movement of controller in the front car. The car was also supplied with recuperation. 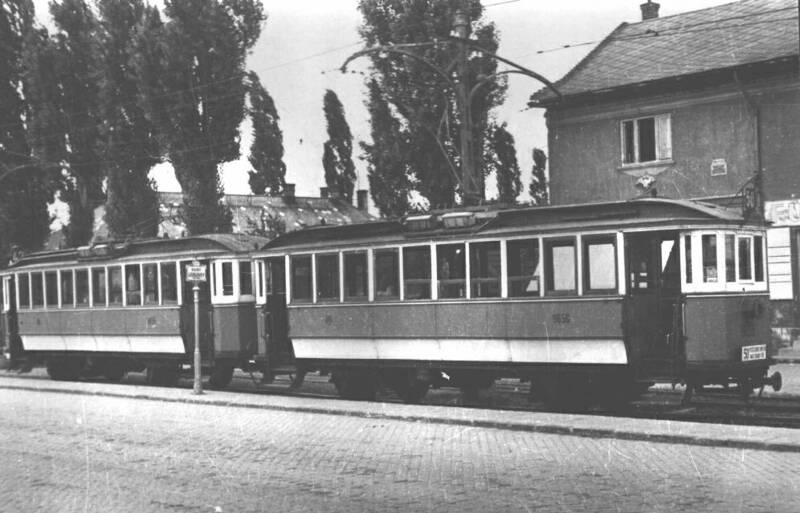 The # 9656+9655 ten-window twin car on Üllői út near Kispest depot (early '40s). 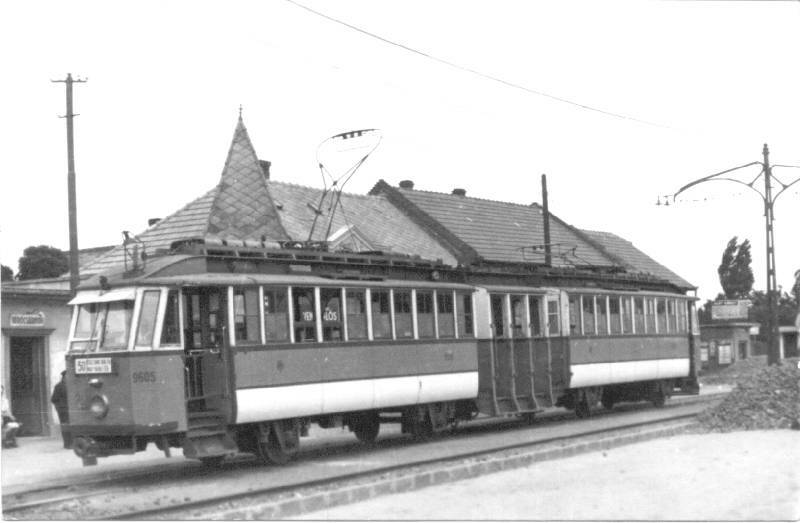 The # 9507 tramcar in Kispest depot (in the early '40s). This car also was destroyed in the fire at Kispest depot. Afetr the fire of Kispest depot frim the original 49 pairs of twincars remained 34. These were rebuilt from 1948 composite construction. This car was rebuilt to composite construction - with changing the nine windows to six. 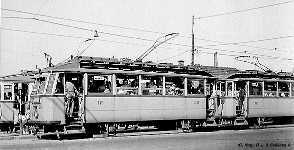 In 1960 recieved a uniform steel-body. It was scrapped in 1977. The "Adél" (# 9604 + 9605) rebuilt to two-motor articulated car. 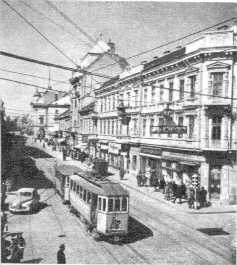 It is at the terminus of line 50 at Béke tér in the end of '40s. Later they removed the central part too, but the windscreen remained. 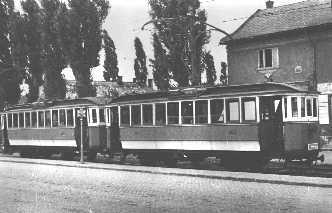 A formerly nine-window (during this time four-window) twin car # 2412 on the single track line 51 at Homokbánya (Sandmine)-passing place in around 1951. This line was bult by electrifying a industrial-railway line in Kőbánya, and another so called "Litter-railway" - an industrial line transporting communal litter. This passing is right between the two railway lines. 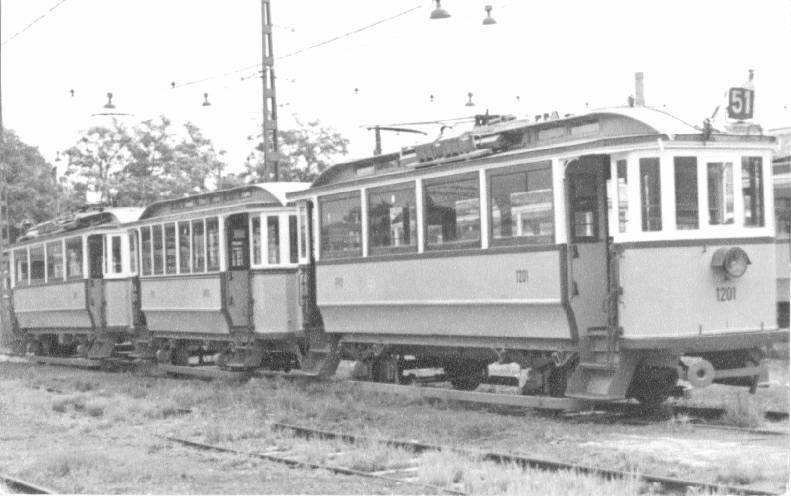 A four-window twin car with a trailer inserted between them (# 1201 + 4800 + 1200) waiting in Kispest depot. These trains ran from 1954 until 1965 on the busy - partially single track - line 51. 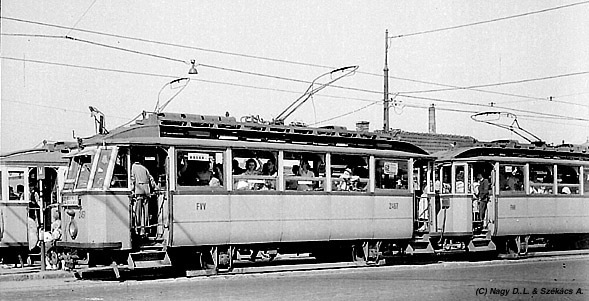 A formaly ten-window (rebuilt to five-window) twin car on Nagyvárad tér on line 52 (in 1957). 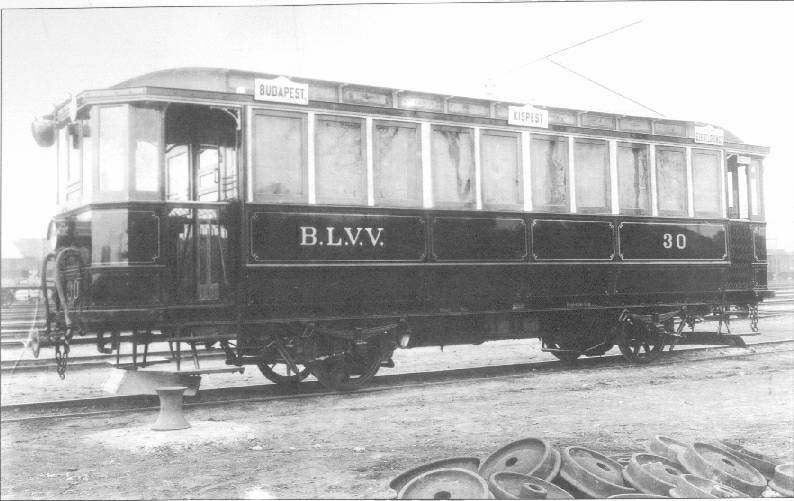 The BLVV twincars were rebuilt to composite construction - and changed to four or five window appearance. These cars had steel sidewalls, but the roof remained wooden. 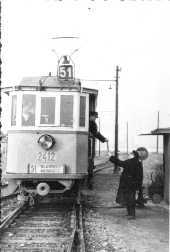 The "Adél" (# 2466+2467) after removing the midlle part on line 52 at Nagyvárad tér (in 1957). The Adél was scrapped in 1971. 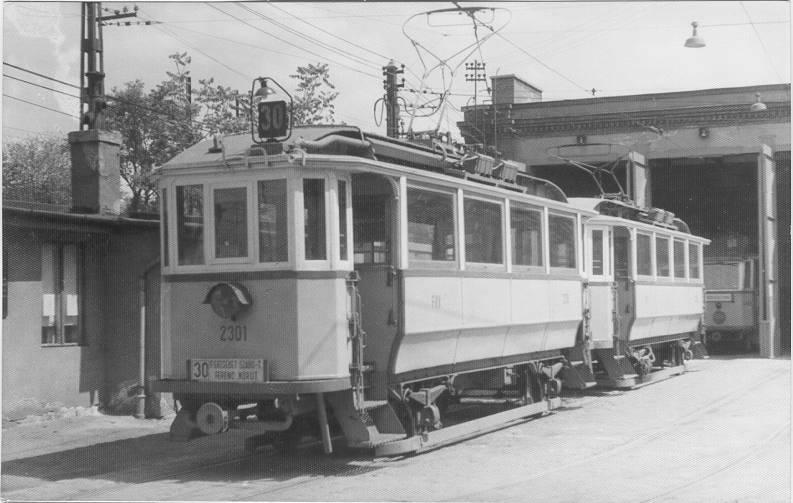 The # 2301+2300 four-window twin car in Ferencváros depot; in the background the "Adél" could be seen (late '60s). 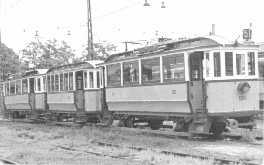 The four-window twincar # 2308+2309 on single track line 69 near MÁV-telep (late '60s). The four-window twin cars were scrapped in 1970. The # 2464+2465 on line 20 in Könyves Kálmán körút (mid '70s). Until 1977 all five-window twin cars were scrapped. 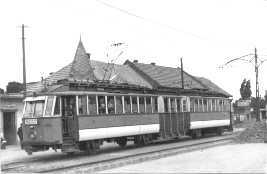 The original twincar # 21+22 is protected by the Transportation Museum. It is waiting to be reconstructed.